Gonçalo receiving the trophy from Figueira Kayak Clube and the main awards from Onda Wetsuits! Gonçalo Duarte won the Sit-on-top class in Figueira da Foz, the last event of the Portuguese national championship, riding one of your Master's!! With bigger and faster waves, choosing the Master was the right choice to win the last 2 heats, with big scores, great surf, leaving all of his opponents behind. This where the perfect conditions to ride our Master...it's fast like an IC, and we can also surf and capable of making great maneuvers!! 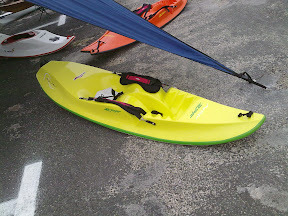 All the news in http://www.Kayaksurf.net and http://www.kayaksurfigueira.com.